Nestled on 1,000 acres of undulating Irish countryside, the Estate is dotted with ancient woodlands and glittering lakes providing a unique setting for timeless wedding memories. We have two unique locations at Castle Leslie, where you can host your celebration so why not choose the one that suits you best. • The magnificent Castle at Castle Leslie Estate is full of old world grandeur and character and can accommodate wedding parties with up to 70 guests (please note that the Castle option is available on midweek dates only). • For larger wedding parties, The Pavilion is a delightful space overlooking Glaslough Lake, which can accommodate up to 260 guests. Castle Leslie Estate has the facilities to host wedding ceremonies, civil ceremonies and partnerships. Wedding ceremonies can be performed in the picturesque surroundings of St. Salvator’s Church on the Estate or there are a number of beautiful ceremony venues in the area including St. Mary’s Church in Glaslough and Monaghan or Armagh Cathedrals amongst others. We also offer some enchanting locations in which to host a ceremony or blessing. This is possible either inside the Castle or your ceremony can be hosted in the Castle Pavilion. For an even more unique experience we can help you plan a wedding ceremony in the great outdoors of our picturesque Estate, we have leafy woodlands, shimmering lakes and stunning gardens that can be tailored to your requests. of 100 bedrooms located in the Castle, the Lodge, the Old Stable Mews and the Village Cottages. At Castle Leslie Estate we have a reputation for fabulous food and we pride ourselves on preparing beautiful dishes using the freshest ingredients. Our chefs source regional and artisan foods locally and prepare and present them with imagination and flair. We appreciate that this is your special day and we promise you the discreet personal attention and service that you deserve. We would be delighted to help make your wedding celebration a day you will always remember. Turning your dream into a reality is our heart’s desire. 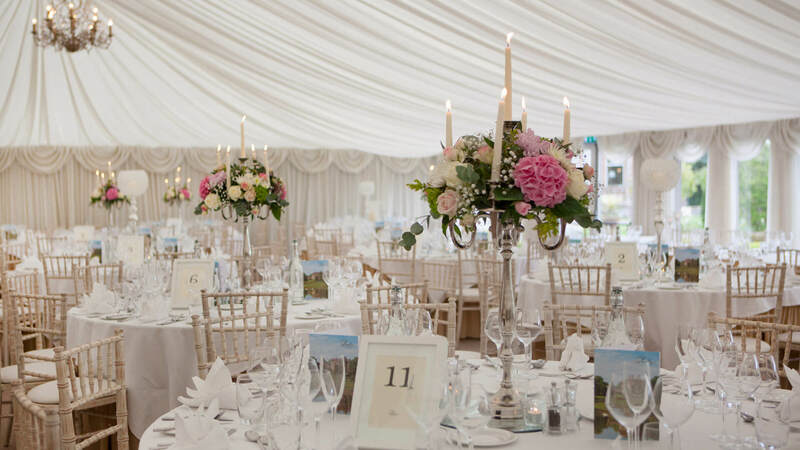 We would be delighted to show you around the Estate or discuss any aspect of your wedding plans and how we might be able to accommodate you, your family and your friends at Castle Leslie Estate. Please contact us at the details below to make an appointment in advance of your visit. To arrange a private viewing, call us now on +353 47 88100 or email events@castleleslie.com. A copy of our Wedding Brochure is available HERE. Minimum numbers apply for weekends and bank holidays.